On the group visit to Oare on 12th August, Malcolm spotted a colour ringed Mediterranean gull. After much deliberation, and several telescopes focussed on the bird, we managed to read it as “yellow ring AYEZ”. 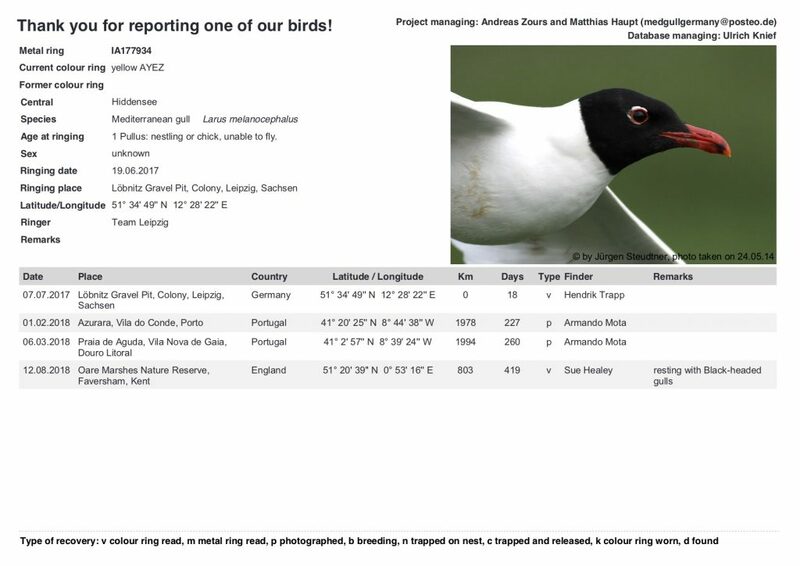 Here is the record for this individual showing that the bird was originally ringed whilst in the nest in Saxony, Germany, on 7th July 2017, so is in its second calendar year. After ringing the next two sightings were in Portugal before it was spotted at Oare. It will be interesting to see if it stays for the winter. Yes, Julie, I know they have quite a wide distribution in Europe, but its always interesting to see how far individual birds travel. According to my copy of Collins guide it says “Scarce annual visitor to Britain & Ireland, mainly in South and East (mostly migrants from the Black Sea)” – they obviously haven’t got up to date with them breeding in our area yet.